I had a rare hour long get out of jail free card this afternoon thanks to my mom coming over to watch the kids, and since I’d already gone to Crossfit early this morning at 6am I was able to zip to the mall and grab some tanks to try on. First off was the Practice Freely Tank in Lavender Dusk. 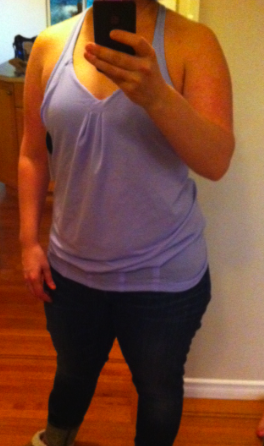 I love the color of this tank, especially paired with Deep Indigo bottoms, but I just didn’t love the way the tank looked on me. Something about the sides of the bust where the top panel of fabric doesn’t wrap around. 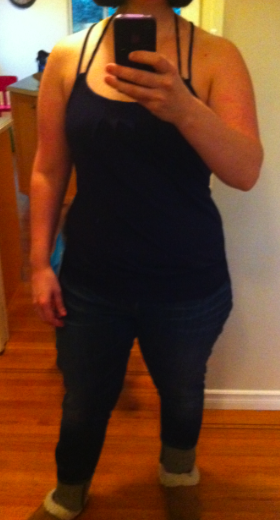 I also didn’t love how voluminous the bottom of the tank was even in the size down (this is a size 8). The back was nice but then again I felt really exposed having such an open back and also having the sides so open as well. I’m looking forward to seeing different tops in this color. The Flow and Go Tank in Deep Navy was really a surprise. I loved the color and really liked the fit for casual wear and how light and airy it felt. I sized down to an 8 and the 8 felt really comfortable and loose in the straps. I can’t imagine how much more unsupportive and loose the straps would be in my TTS 10 but I know it wont work for me. 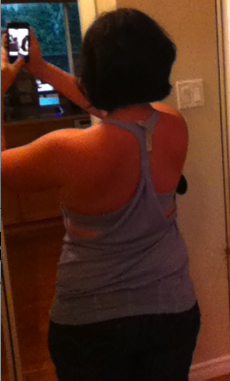 The only negative in this tank is that the bra IS so unsupportive and the straps are so stretchy. I feel like every few minutes I have to hike the straps back up and lift the girls to their proper location. I’d pass on this tank except that I saw a girl a few weeks ago wearing an older version of this tank to Crossfit and she layered it over a very supportive bra. 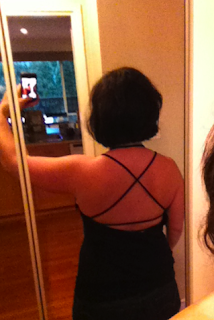 It wasn’t the best look with all the straps in the back but it didn’t look bad either so I know I can probably wear this to Crossfit for a really airy and breathable top as well as wear it casually in the summer with jeans or crops. I ordered the Dance Strap Tank last night and I only plan on keeping one of these three tanks so it’s all up to wether or not I fall in love with the Dance Strap Tank tomorrow when it arrives but I’ll keep you guys posted. "New! Run: Speed Shorts in Dazzling"